I enjoy watching a good film and I had an opportunity to attend the 13th Eurasia International film festival in Astana, Kazakhstan which went from July 22 until July 28th. 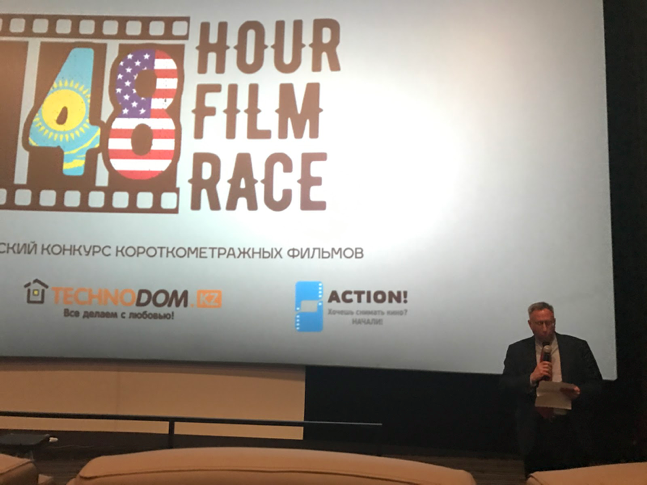 Ambassador Krol from the United States introduced the 48 Hour Film Race. The short films had to include a light bulb and the saying “I did not know the future would turn out like this”. One of the short films included a story about friendship between a student from Kazakhstan and a student from the United States, who found out they had a lot in common even though they were from different countries and they learned about their cultures. Another one, a comedy included a man who buys a light bulb which grants wishes. The wish would come true, however once wished, one would have to relive the dream all over again and cannot undo the wish. The man wished that all the women would fall in love with him. He regrets that decision immediately running and hiding from the women who are chasing him. He wakes up every morning thinking that it was a dream only to realize that the light bulb is there to remind him what he wished for and his wishes turn into nightmares. This particular short film made me realize to be careful about what I wish for. One of my favorite short film was about an older man who was looking at pictures and realizing how much he has lived through and appreciating the small moments in life. Although he is seen as sad about getting older by looking back through his past, he realizes how much happiness those moments brought him and shares them with his granddaughter. I was able to see two of the main competition films Centaur and Arrhythmia. During the Centaur a Kyrgyz film, I found myself smiling and crying. I found a new sense of understanding that I have never seen before. The main character struggles with self-identity, family life, romance, past life and present life, allowed me to appreciate the energy people have to fight for something they believe is right, even though they know it will lead them to great consequences, but they do it because it is within their heart to do the right thing. The main character steals horses to grant them freedom. When he steals from his own brother and gets caught he explains that during their nomadic past, Kyrgyz people lived alongside with horses, however people got caught up in money and power and have mistreated the animals. “The Horse is the wings of man”-Kyrgyz Proverb. The film Centaur was about the energy of the people who go through great suffering in order to change the world they live in. I found myself not able to control my tears and hoping the lights in the theatre would take their time before turning on.